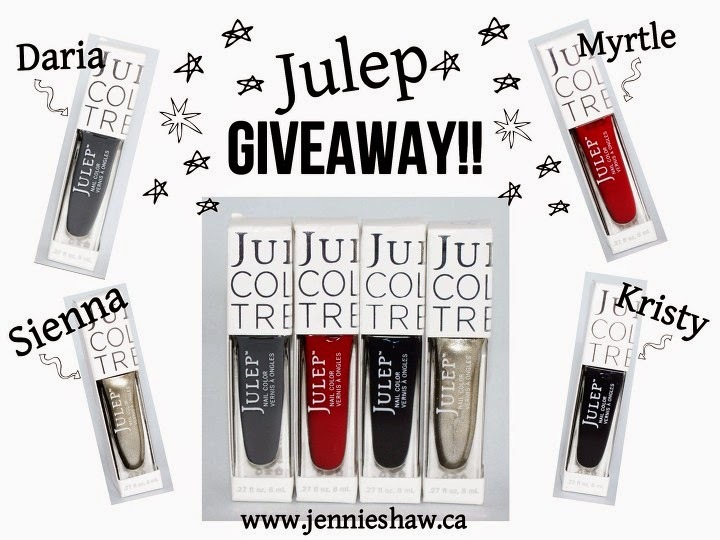 jennie's nails and tales: julep giveaway winner!!! After an astounding 530 entries (you guys and gals must LOVE you some Julep polish, haha) I'm delighted to announce that daniela is the winner!! Congrats, girl!!! You get them allllllll. Also? You sure must be surprised because your avi looks straight up shocked. Or confused. Maybe a little of both? Haha! Thanks to all who entered! And thanks again to Julep, for being so generous! I loved hearing about your favourite fall colours, so thanks for all of the comments, fellow nail polish enthusiasts! Dark reds, greens, and blues were the most popular, but I'd like to give a special shout out to karin, who chose mint green. Eff those darker colours. Haha! You do you, karin! Love it! And on that note, have you discovered what kind of beauty profile you are? I rotate between Bombshell and It Girl. Because, obviously. Haha! Sign up to be a Maven and you'll get to choose fun polishes each month, delivered right to your door. Also, if you join via the link, because it's a referral (meaning I'd get some Maven points if you join) you'll get an extra special Halloween bonus! YAY! OMG, I WON! I never win ANYTHING! Seriously, no lie. I discovered a new white wine and I think you will love it as much as I do. And if you don't - no hard feelings, more for me.